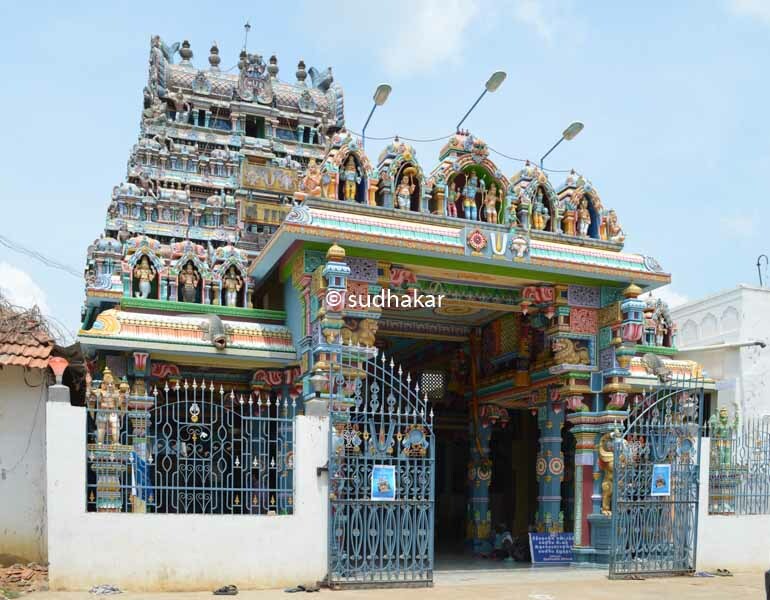 Located 14kms west of Mannargudi is the Sri Kothandaramar temple at Vaduvur. This is one of the Abhimana Kshetram of Lord Vishnu and is also called as Vakulaaranya Kshetram. Here the main deity, Sri Kodhandaramar along with Sri Seetha Piratti, Lakshmanan and Hanuman appear in ‘Thirukalyana kolam’. 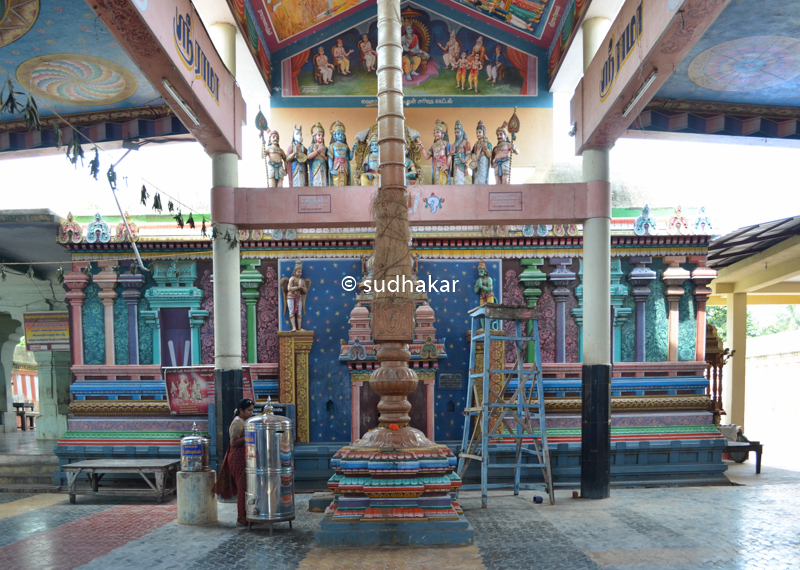 The original deity in this place is Sri Gopalan with Goddesses Rukmini and Sathyabhama. 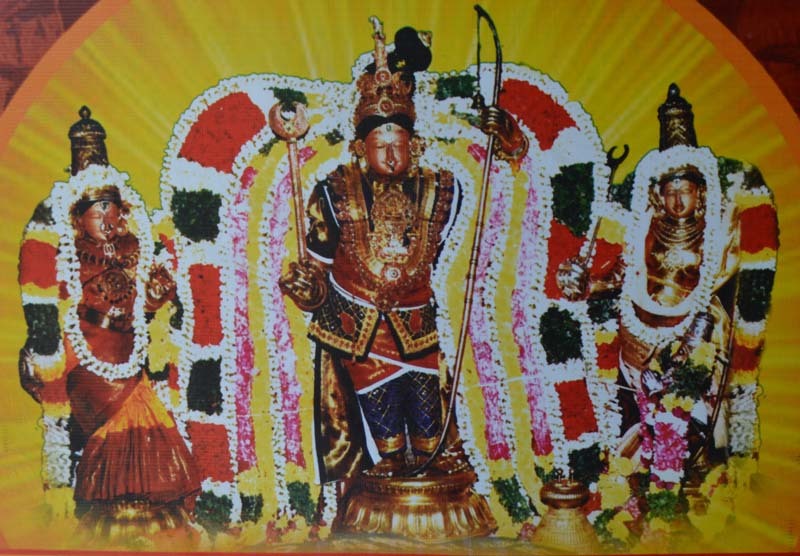 The other holy names for Vaduvur are Vagularanyam (magizhankadu), Bhaskara Kshetram and Dhakshina Ayodhi. Vagula maram (maghizham tree) is the sacred tree of this place. The legend of this temple goes thus: When Rama completed 14 years of vana vasam in the forest and was preparing to return to Ayodhya, the sages prayed asking him to stay with them. Torn between duty to return to his kingdom and love towards the sages, Rama created His own enchanting divine form as an idol and left it outside the ashram and went to Ayodhya. The rishis who came to see Rama and Seetha the next day were fascinated by the magnificence of the idols. The village people constructed a temple and were worshipping them. Centuries rolled by and it was the time when king Sarabhoji ruled Thanjavur. One night, Lord Rama appeared in the king’s dream and asked him to unearth the deities from Thalai Gnayiru ( near Thiruthuraipoondi). SriRama asked the king to establish and worship the deities. The king awoke and proceeded immediately, with his troops to Thalai Gnayiru and unearthed the deities. He took possession of Rama, Seetha and Hanuman statues and on his way rested at Vaduvur. The people of the Vaduvur village came to know about the idols and pleaded with the king to establish the deities in their Rukmani-Sathyabhama samedha Gopalan temple. After a lot of persuasion the king allowed them to establish the idols and since then Rama has been the main deity in the Gopalan temple. The Moolavar of this sthalam is Kothandaramar. The Thayaar in this sthalam is Goddess Sita pirati.